Knock out the launch quests in Whispers of the Old Gods during launch week and you'll earn 10 free card packs. During yesterday's Hearthstone live stream showing off the upcoming Whispers of the Old Gods expansion, Blizzard announced a couple of special launch quests that will net players free card packs. These quests will only be available during launch week. The first quest tasks you with winning two games in Standard mode, the new mode where older cards aren't allowed. Do it, and you'll get five free card packs. For the second quest, you'll have to win seven more matches of Standard, which will reward you with five more card packs. You'll even get a reward just for showing up, as anyone who logs in next week with the expansion will receive three free cards. 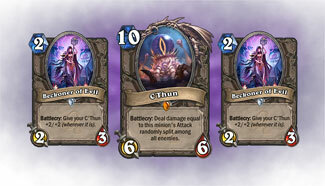 Standard is the newest game mode for Hearthstone. First announced back in February, it doesn't allow the use of cards from older expansions, which seems intended to make the game more friendly to newcomers who lack the massive card collections of long-time players. Whispers of the Old Gods will launch on April 26.